Geoffry is quite frustrated still chained to his own bed as well. Poor sap. You guys’ll get color sometime this weekend. xD Preparing for family visiting this next week so things’ll get sporadic. And yes, Sedrick felt like being fun and old school. Poor Janus. But really, that’s a horrible way to be trapped for days on end. Funny now, horrifying later. Bad Sedrick! ‘He was feeling romantic.’ ……Wait, what? Oh, you are such a tease liliy. You realize she’ll dump you in a couple weeks, they always do. Arthur: Yah so, towers have many uses you know,not just for impressing pretty girls. So I’m goining to build one any way. Sedric: *sigh* Fine but this will seriously dip into or funds. Is the dress pink? I REALLY HOPE IT IS PINK!!! OOO, that would be lovely. I just can’t wait it see the dress in color. But Pink would be perfect! I wonder if she’ll finally take off geoffry’s chain after this whole ordeal is over…probably not. Am I the the only one to wonder how violence changes clothes? He forced her into the clothes and she fought back. I am loving this arc so much. 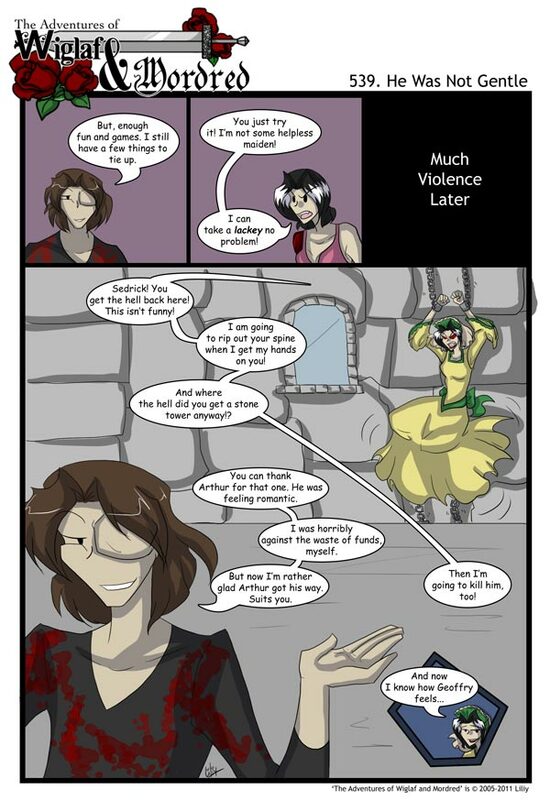 where did her bleeding shoulder wound disappear to in the first panel? I think the “romance” comment means he was feeling fanciful and imbued with or dominated by idealism or a desire for adventure. Right? *Looks up in a dictionary* Yep, somthing like that! Let’s just hope her sholder’s cleaned up, and someone’s feeding the husband. The prison in the stone tower is a nice touch. XD And Sedrick obviously made sure she looked like an imprisoned maiden when he selected her new wardrobe. Oh the irony of it all – at least there was no iron-maiden in need of being put to good use. Wonder where Geoffry is at the moment? Is he doing better job at making Garot twins harmless than Wiglaf? At least that would be it to me… One should not leave serious stuff to swedish they are not just cut for it any more, another thing was when they still had that Viking in them *insert various jokes of swedish here*.